I continue to give review to orphan early cards and I'm just amazed to find this one doesn't have any yet ! Big fricking RP, one of the most popular Corp identity, mind you. Well, I won't make a deep study of its power, you all have seen it in action if not ever played it, but just make a little history. First, it was weak. But it was a whole faction concern. Jinteki: Personal Evolution did not make it either. 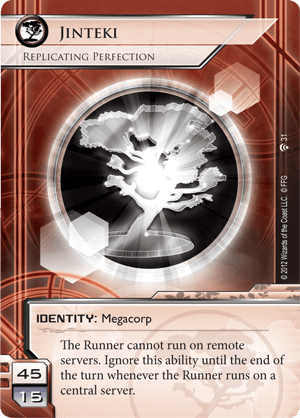 Jinteki was only the mind game faction, and used to lack all it has today, and all other corps already has at the time : good economy and good ices. Did you want to play Jinteki, you had to fill all these gaps with your influence, and then, probably still had to click for . But at this time, RP has been the subject of a seminal blog post on BGG (https://boardgamegeek.com/blogpost/19853/my-secret-love-affair-jintekipersonal-evolution) theorizing the "work compression", nowadays best known as "click compression." A first stop to fame. The bonsai starting to see the light during the Spin cycle, with the release of a bunch of good cards : Celebrity Gift first, giving a strong economy event while sticking to mind game flavour ; Sundew, then giving a dripping economy, especially strong with RP ; also some other nice cards, if not that impactful : Yagura, Himitsu-Bako, Shock! ; and then Caprice Nisei, which really put a boost for RP. Then Honor and Profit was released. Every deluxe tends to offer more power to one of the two faction they cover, and Jinteki was the real winner of this one. RP became tier-1 (and PE did well, too) and sticked to it for a while. Well, it seems to have lost a little bit of its lustre these last days, and I don't really get why, but it remains a strong identity.